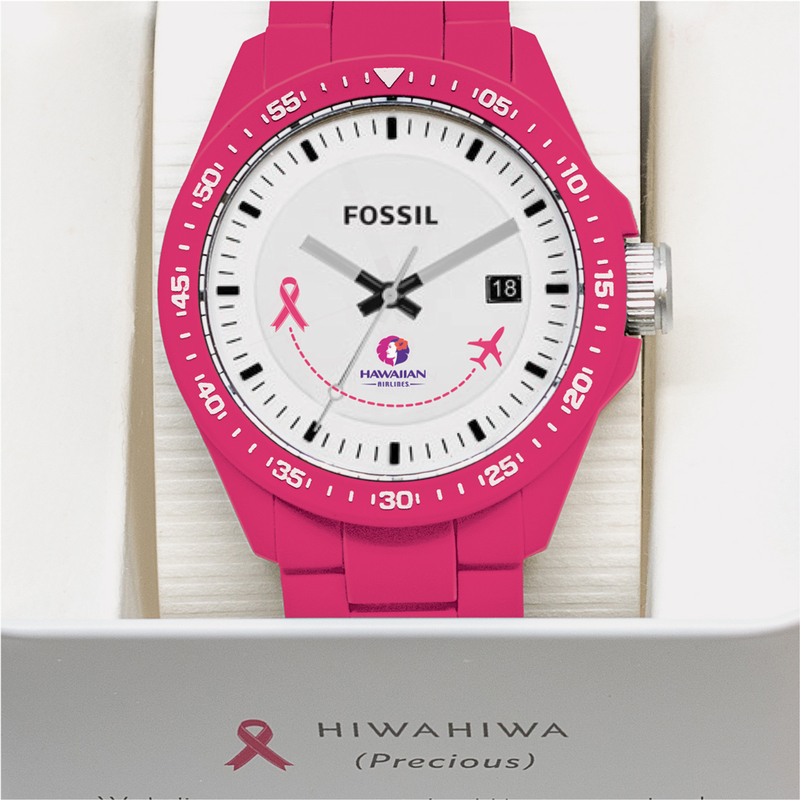 HONOLULU – Hawaiian Airlines is honored to promote breast cancer awareness and raise funds for education and research through a new ‘Time is Precious’ partnership with watchmaker Fossil to support ’Imi Hale, the Native Hawaiian Cancer Network. In observance of Breast Cancer Awareness Month, co-branded Hawaiian Airlines/Fossil watches featuring a pink ribbon design will be available for purchase from October 15 to October 31 aboard Hawaiian flights between Hawai‘i and North America, Australia and New Zealand. 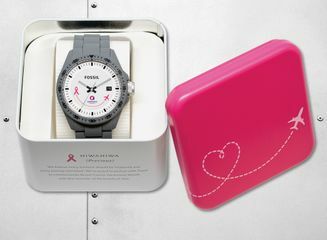 The limited-edition watches may also be purchased through the Hawaiian Airlines online logo store. Sales proceeds will be donated to ’Imi Hale, a community-based health network dedicated to cancer prevention and healthcare access among native Hawaiians and Pacific Islanders. 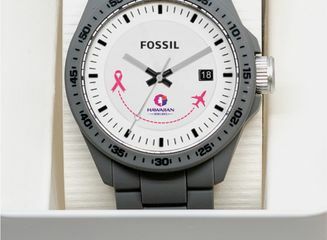 The idea for the partnership originated from Hawaiian Airlines employees, some of whom have been personally affected by breast cancer, as a way to raise awareness about the disease and support research. 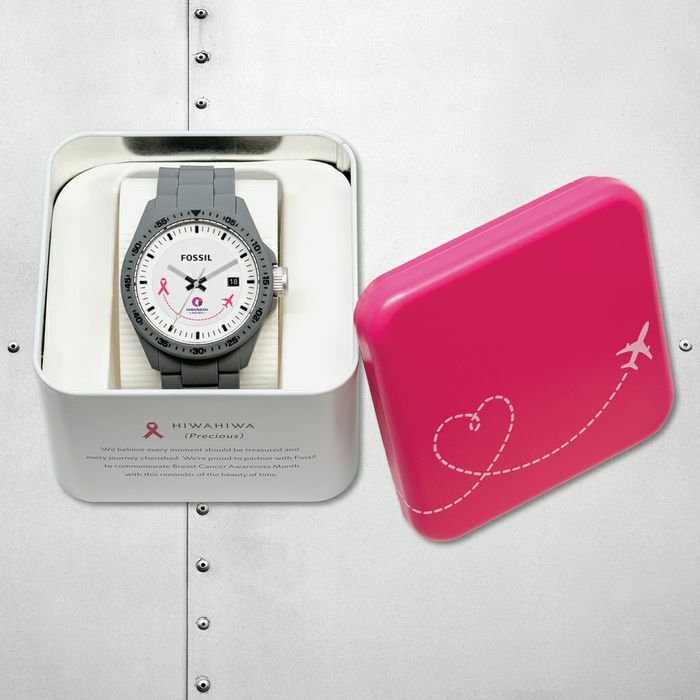 The watches, offered in pink or gray for $95, are housed in a custom tin case adorned with an airplane graphic, along with the word Hihahiwa (precious) – a reminder of the beauty of time and that every moment should be treasured. The ’Imi Hale Native Hawaiian Cancer Network has trained over 200 people to serve as “Cancer Patient Navigators” who assist patients with timely access to education, treatment and support services, said JoAnn Trask, ’Imi Hale project director. 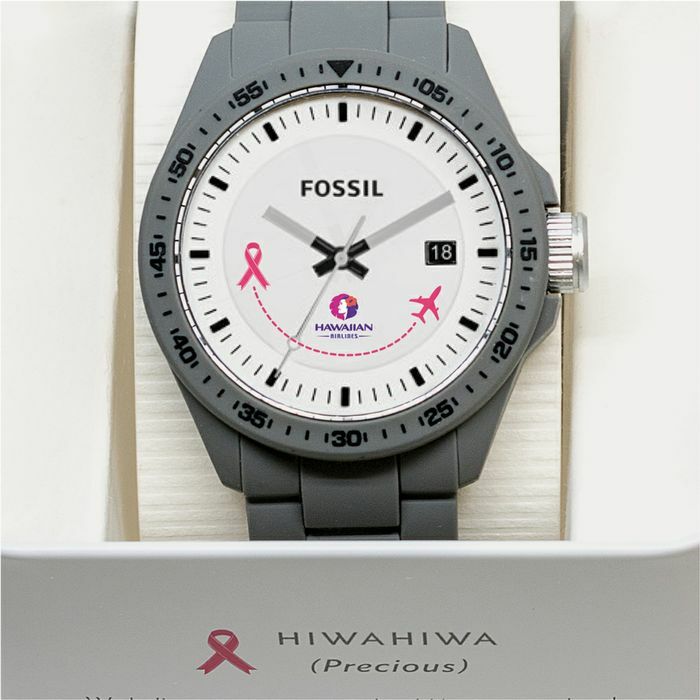 Hawaiian’s partnership with Fossil and ’Imi Hale is among a host of company initiatives to support worthy causes throughout the state of Hawai‘i. The Hawaiian Airlines Foundation annually presents grants in three categories: education, culture and environment. In 2014, corporate giving supported 128 organizations, while more than 1,700 employees volunteered at events sponsored by 48 organizations. Additionally, Hawaiian matches miles (up to 500,000) donated to 10 designated charities, including the American Cancer Society Hawai‘i Pacific.